Jah Cure and his ex-wife Kamila McDonald have reunited at the recently held Jamrock Reggae Cruise. Jah Cure and Kamila McDonald got married in 2011 and welcome their first child together in 2012. The pair started having marital problems in 2015 and later that same year they were separated and Kamila filed for divorce. It’s unclear if they were ever officially divorced or if they are back together now or just friends. The social media personality has been in Jamaica over the past week doing a number of projects that he is working on. Seems one of the gigs he did in reggae land was a roll in Alkaline new video for his dancehall banger “Pretty Girls Team.” The Young Chang-directed cut features Fatboy and Alkaline going up against each other with their all girls football teams. The cut starts out with the Instagram star warming up his ladies while Alka strolls into the ball park like a real boss. The Vendetta “Pretty Girl Team” eventually win the match but all the ladies on both sides win in my eyes because they are all banging. Alkaline made headlines today for a different reason, his beef with longtime rival Tommy Lee Sparta. The two deejays have been going in on each other on Instagram since last night and now some dancehall fans are calling it a publicity stunt to bring more attention to their music. Watch Alkaline new video “Pretty Girl Team” below. 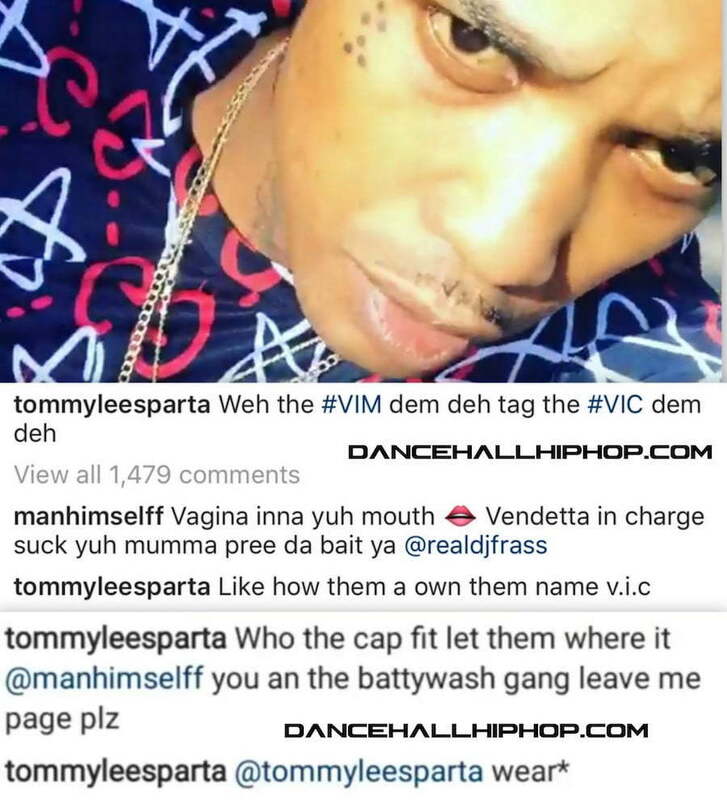 Alkaline and Tommy Lee Sparta have reignited their beef on Instagram this weekend. Yesterday, the “Uncle Demon” deejay posted a video on the Gram taking a subliminal at the Vendetta boss. “Weh the #VIM dem deh tag the #VIC dem deh,” he wrote. In the video clip he explains what he really means by VIM. “Yeah man a VIM, very important murder, some boy a VIC, very important coward,” he said. “Who the cap fit let them wear it @manhimselff (Alkaline) you an the battywash gang leave me page plz,” Tommy Lee continues. Alkaline and Tommy Lee Sparta have been beefing since the start of the year but their feud has been mostly one sided with the Mobay deejay dropping a ton of diss tracks. The Vendetta boss, on the other hand, has only released around two songs taking subliminal shots at his rival. Are ASAP Rocky and Model Tina Kunakey Dating ? ASAP Rocky and smoking hot VC model Tina Kunakey are dating. The Harlem rapper and the Tina sparked dating rumors over the weekend when they were spotted showing some PDA while walking in New York City. A$AP, born Rakim Mayers, is notorious for dating models and was last linked to Kendall Jenner. The rapper and Jenner split earlier this year and already he is moving on to another hot model. Paparazzi snapped Rocky and Tina holding hands and sharing a few laughed as they made a stroll through the streets of the Big Apple. Aside from banging models and making some appearances at fashion shows and in fashion magazines, ASAP Rocky is currently working on two musical projects due sometime soon. The ASAP Mob leader is reportedly working on a joint album with French Montana and also his next solo effort that has been in the works for several months now. “Me and Rocky got a project,” French Montana said during a recent interview. “[We’ll] be coming out with it real soon.” ASAP says that his upcoming solo album will feature a new sound that he is testing in an effort to not sound like everyone else currently. #NewCoupleAlert ? #ASAPRocky appears to have a #newgirlfriend in #TinaKunakeyDiVita. The two were spotted looking #verycozy as they strolled around New York together. A$AP, whose real name is #RakimMayers, was last romantically linked to #KendallJenner. Last year Tina dated French actor #VincentCassel – who turns 51 next week – for a number of months.